So once again I found myself behind the eight ball where Nicolas Jaar is concerned - or more precisely, behind the little silver cube. You see, if I had heard Jaar's sweeping, witty and gorgeous debut album Space Is Only Noise in 2011 it would have almost definitely horned it's way on to my Top 10 list for that year. So I resolved to keep a close eye on the young man's musical activites, which he conducts while a student at Brown University. 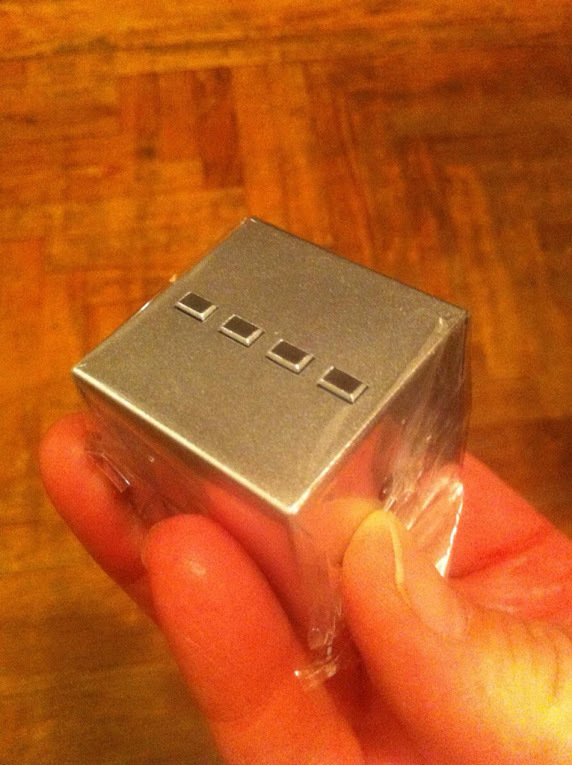 Well, I may have to set up a Google news alert or something because I became aware of Jaar's ultra-cool little cube called the Prism over four months after it was released in March. Of course, now that I'm looking I've found plenty of chatter about Jaar's unusual method of releasing Don't Break My Love, a sampler of the artists affiliated with Jaar's Clown & Sunset enterprise (it seems reductive to call it a label). All is well now, though as I have my very own copy of this intriguing little item. In a way it's a very simple idea, sort of a cross between selling music on a USB stick and the Buddha Machine. 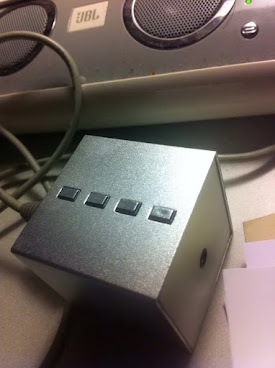 The pictures tell the story: it's a little aluminum cube controlled by four buttons. You can't add music to it, or rip the files from it, even though you charge it through the USB port on a computer. However, the Prism does encourage sharing of a more elemental sort by incuding two headphone jacks. Romance, it seems, is not dead after all. And the fact remains that the Prism is filled with over an hour of cutting edge electronic music by Jaar and his compatriots - music that you can't get anywhere else. Exclusive, elegant and fun: well worth the $40. 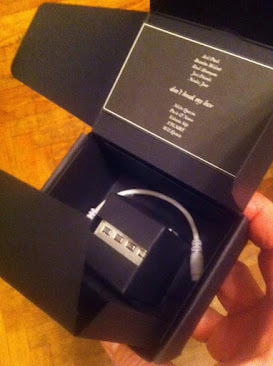 The packaging is beautifully considered. The Prism in use at my desk.